The spectacular programme for the Belfast International Arts Festival 2017 launched in New York City on Monday, 18 September. The Festival’s Artistic Director and Chief Executive, Richard Wakely accompanied by the Lord Mayor of Belfast, Councillor Nuala McAllister, announced an eclectic and exciting line-up for the annual celebration of contemporary arts and ideas from 14 countries around the world. The timing of this year’s Belfast International Arts Festival coincides with an exciting bid by Belfast City Council and Derry and Strabane District Council for the designation of European Capital of Culture in 2023. Belfast International Arts Festival brings an electric fusion of cutting edge performances to the stages, galleries, concert halls and site specific and outdoor locations across the city with 191 events taking place from 6 – 28 October 2017, including 12 premieres. 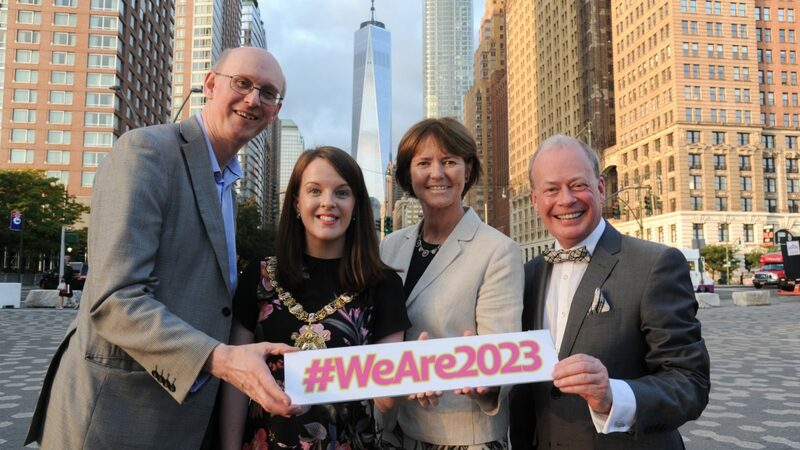 “We are delighted to welcome the Lord Mayor of Belfast Councillor Nuala McAllister and Festival Director Richard Wakely to New York, to launch the 2017 Belfast International Arts Festival and support the joint Belfast and Derry/Strabane Councils bid for European Capital of Culture 2023 designation. Tourism Ireland is targeting a ‘Culturally Curious’ traveller in key markets across the US. Belfast is a vibrant and rapidly changing city, offering an exciting variety of unique and authentic cultural experiences, including the flagship annual Belfast International Arts Festival which brings performances to stages, galleries, concert halls and outdoor locations across the city. Northern Ireland has a unique story to tell and a cultural offering that sets it apart from other European destinations”. Getting to Belfast has never been easier with non-stop flights from New York and Providence, RI on Norwegian Air. Belfast is also easily accessible from Dublin, less than 2 hours away. A record number of US visitors will visit Northern Ireland in 2017, who will also enjoy visits to the iconic Titanic Belfast, voted the world’s leading tourist attraction, touring the scenic Causeway Coastal route, the walled City of Derry and visiting Games of Thrones film locations’. Compassion: The History of the Machine Gun –Berlin’s acclaimed Schaubühne Theatre open the festival with the UK and Ireland premiere of a hard-hitting new work from the Swiss director Milo Rau exploring the limits of human compassion in a globalised world. Celui Qui Tombe (He Who Falls) – a perilous spectacle of survival sees artists swing, spin and pivot on a suspended podium in the Grand Opera House in this new contemporary dance work from leading French choreographer, YoannBourgeios. Gardens Speak – an award winning and deeply moving interactive audio installation from Lebanese artist, Tania El Khoury containing the oral histories of ten people buried in Syrian gardens and public parks. The Tempest – Ireland: Memory: Identity -A major exhibition of large scale, sculptural paintings from one of Ireland’s leading artists, Hughie O’Donoghue. Featuring several new pieces, The Tempest can be seen at the newly renovated and historic Carlisle Memorial Church in the north of the city. Poppies: Weeping Window – Experience this deeply moving and iconic ceramic sculpture, draped across the front of the Ulster Museum, accompanied by a specially curated supporting programme of talks, music, theatre and literary events, ‘Contested Legacies’ that questions and explores issues around identity, remembrance and reflection and artistic responses to conflict and warfare. Poetry Jukebox – Joint Festival Artists in Residence for 2017, Maria McManus and Deirdre Cartmill, will be bringing poetry to the public realm with a contemporary on-street sound installation at the Crescent Arts Centre. Hard to be Soft – A Belfast Prayer –the world premiere of a new four-part contemporary dance and music stage work, from critically acclaimed dance maker, Oona Doherty (Total Theatre Award Winner, Edinburgh Fringe Festival 2017) with music and soundscape by Ivor Novello award winning musician David Holmes (Ocean’s Eleven and Twelve) Co-commissioned by the Festival with Prime Cut and Dublin Dance Festival, Hard to be Soft; a Belfast Prayer closes the 2017 edition. The Belfast International Arts Festival receives core funding from The Arts Council of Northern Ireland, Belfast City Council, Tourism NI and the British Council event and project funders for 2017 include the Government of Ireland, Embassy of Switzerland in the United Kingdom,14:18 Now WW1 Centenary Arts Commissions and Institute Francais. Festival 2017 partners are Ramada Encore, the Ulster Museum, Visit Belfast and the Belfast Telegraph. Tickets are available now at belfastinternationalartsfestiv al.com; by calling 028 9089 2707 or at the Festival Box Office in The MAC, St Anne’s Square. Follow Belfast International Arts Festival on Facebook and Twitter @BelfastFestival for all the latest news.